Hope you all are well and looking forward to the upcoming spring. Had a good deal of sun yesterday, which was a blessing considering the rather dark and wet winter we’ve had so far this year, at least here in Northern Europe. What do you think about the Armiga? 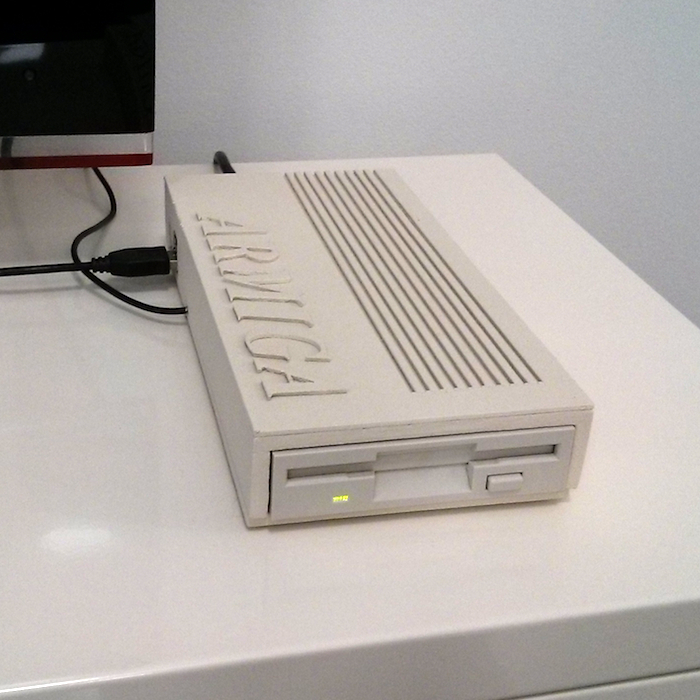 I know some people will shake their heads at the old 3.5″ floppy disk drive, but I LOVE it. 😀 For those who have tons of those disks in their cupboards, they will now have an easy way of getting them onto a modern format, preserving them for the future. Besides, there is something magical (for us nostalgics.. hehe..) to use floppies, hearing them load and so on. The creators of the Armiga have launched a campaign on Indiegogo asking for support/pre-orders. I pledged for “The Armiga Deluxe Edition” and I believe I was the first one to do so. 😉 ETA is November 2014, so looking forward to that month already. The image above shows the prototype in all its glory. 🙂 Looks neat doesn’t it? Anyone else looking forward to this new toy? Welcome back! I don’t want to remind you the New Years resolutions that have been announced here on this blog, but… ups… I did it, sorry 😉 Glad to have you back! The floppy… You know what. This is something I do not feel nostalgia for. The reason is simple – this was my main storage device for *too* long 😀 And I do hate even that ‘click’ sound in the uae emulator. Yuck! But the project looks cooooool. I’d wish MIST (http://lotharek.pl/product.php?pid=96) had a similar skin. Hi there! Hehe.. I knew that my New Years resolution would backfire some day. 😉 To me the sound of floppies loading is like the sound of Elvis to Presley-fanatics. 😀 Now.. the looks of this thing is neat. Like it a lot. Only 10 months to go until the release. The crunching of floppy disc loading was like Marmite. You either loved it or hated it! Thanks for reblogging. 🙂 Cheers! Many thanks! 🙂 Much appreciated! I’ll head over to read now. Hi Acebow! Thanks for commenting and for visiting! 🙂 It is quite a neat project – I follow their Twitter-account and they have published some cool stuff lately.